(Phys.org) -- Researchers from Trinity College Dublin have shown that insects are made from one of the toughest natural materials in the world. The studys findings have been recently published in the leading international biomechanics publication, Journal of Experimental Biology. All insects are made from a material called cuticle, said Dr. Jan-Henning Dirks, who studied the properties of this amazing material together with Professor of Mechanical Engineering David Taylor at the Department of Mechanical and Manufacturing Engineering. The two researchers then measured the force needed to bend and break single grasshopper legs. They found that although the legs are not very stiff, surprisingly they can withstand remarkably high forces before actually braking, even when small cuts were introduced to deliberately weaken them. Usually if you want a high fracture toughness you have a high stiffness, said Dirks. 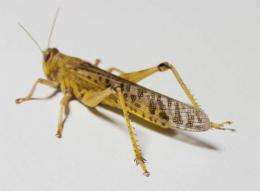 However, their experiments show that grasshopper legs have an almost unique combination of relatively low stiffness with a high toughness. The toughness we measured for the grasshopper leg is amongst the highest of any biological material, said Taylor. The cuticle is tougher than bone, and as good as antlers or horn. This gives the insect leg an exceptional ability to tolerate defects such as cracks and damage, which might occur during jumping or fighting.